Games were an integral part of my childhood. It was long before the era of twenty-hour television, and as I’m one of six children, we needed group activities. So we played card games, board games, ball games, and ones that came straight out of our imaginations. My sister made up with one called ‘Post Office’ where we wrote each other letters. After all, who doesn’t love to receive mail? These activities are such a part of my story and my family history. So what better way to honour our ancestors than incorporate them into something that represents family fun? 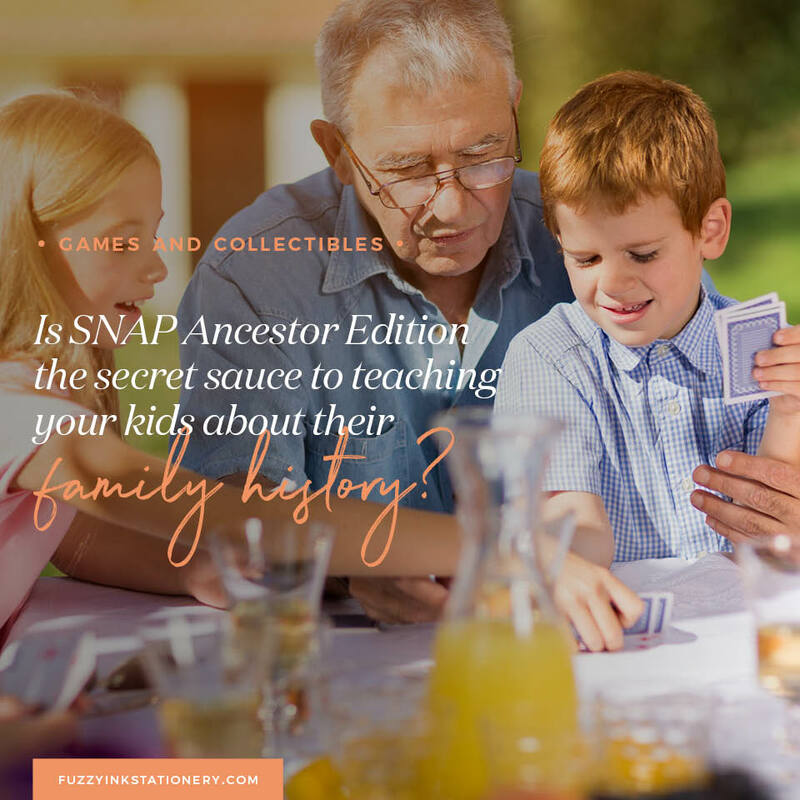 It doesn’t matter whether it’s Grandparent Guess Who, Ancestor Trading Cards or SNAP Ancestor Edition, get creative and make a family history collectible. Because I grew up in a large family, games were an easy way for Mum to keep us occupied. While we weren’t at all quiet, she knew where we were and what we were doing. We always exceeded the 2 to 4 player limit that so many games have, therefore we had only one option. We got creative. First of all, there were rules to adapt, then game boards to create, and cards to draw. As a result, these simple activities created as much fun and friendly disagreements as playing the games themselves. One of our handcrafted game boards. Thanks to my sister for holding onto all of them. While it seems like our inspiration came only from existing games, that’s not the case. Many ideas came straight out of someone’s imagination. As a result, our game rules were often the most creative part! I’m halfway through creating an Ancestor Trading Card template. Although I love the idea of trading cards, do they appeal to everyone? Maybe. But what if I could make them a part of a game? 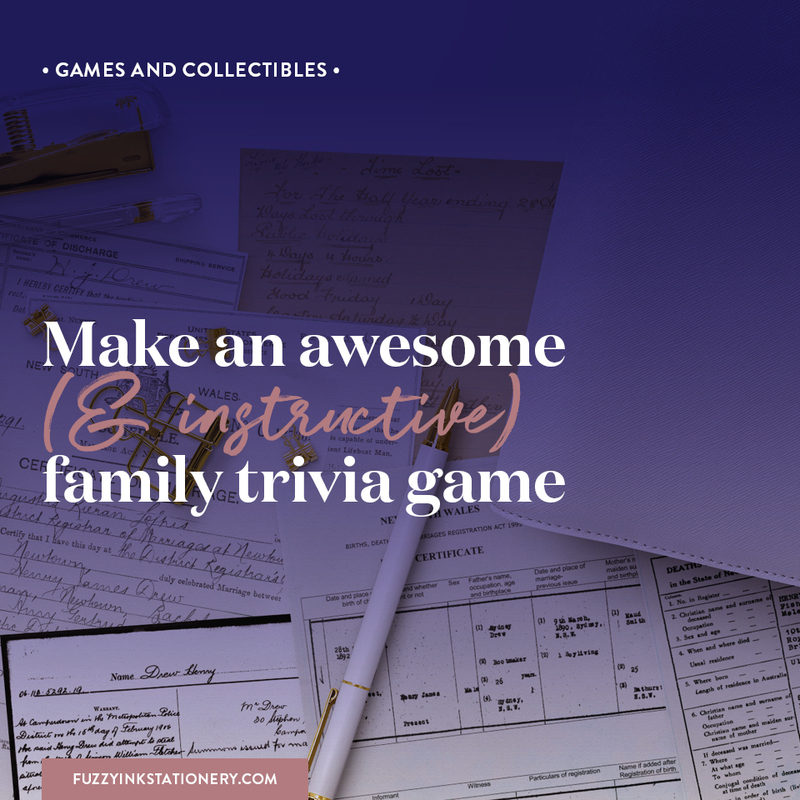 If learning their faces and names was fun, then who wouldn’t want to learn about family history? While that was a great idea, it quickly became bigger than Ben Hur. Rather than create a ‘Magic The Gathering’ style of game, I decided to simplify the concept. So this got me thinking of other ways to show off my ancestors. As a result, I now had two ideas instead of trying to make one size fit all. Hello, SNAP Ancestor Edition template. My family play a couple of versions of SNAP. Our favourite uses a single discard pile. Then, as you see a pair, there is enthusiastic slapping of the cards while shouting SNAP at a deafening volume. Watch your fingers on this one, because everyone smacks at once. Another favourite was Animal. Each person chose an animal sound. Then the other players had to make the animal noise of that person when they would discard a matching card. Sounds easy right? Because one of my brothers would always pick a goldfish, it wasn’t so simple. None of us could ever agree what sound a goldfish makes. What rules do you use to play? Click here to view the standard and some variations of the rules of the game. Which set will you apply to your version of SNAP Ancestor Edition? First of all, the template has eight cards on a page. Choose from either an A4 or US Letter template. I recommend creating a 56-card deck because that is suitable for 2 to 3 players. Have more players? Add another four ancestors (16 cards) per player. The US Letter cards trim down to 2.25″ x 3.5″ (width x height), while the A4 cards are 60mm x 90mm. Print on a cardstock similar to 250 gsm (90 lb cover) or 300 gsm (110 lb cover). Another suggestion is to laminate the cards. 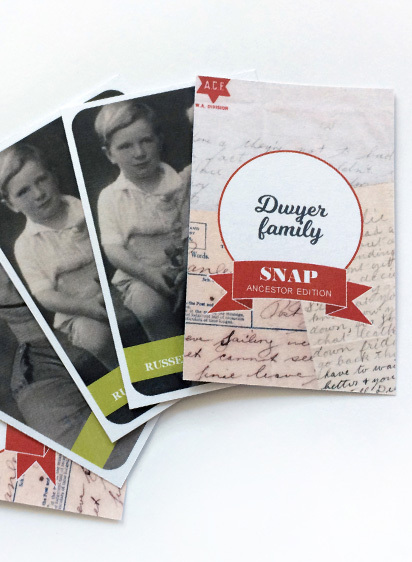 Some options to customize the back of SNAP Ancestor Edition cards. Left to right: 1 & 2 show original fonts and placement with different colours. 3 & 4 show different fonts, placement and colours. The front is also easy to update. Click and add your ancestor photo, then one or two lines of text. Then copy and paste to create three more cards, so there are four identical cards for each ancestor. The black line is the trim line. Follow this to cut out the cards and get ready to play. The front of a card should have four identical images (one row). I’d love to see how you use the template and the cards you make. Share them on social media with the hashtag #warmfuzzyprintables. Or send me an email with your photos. 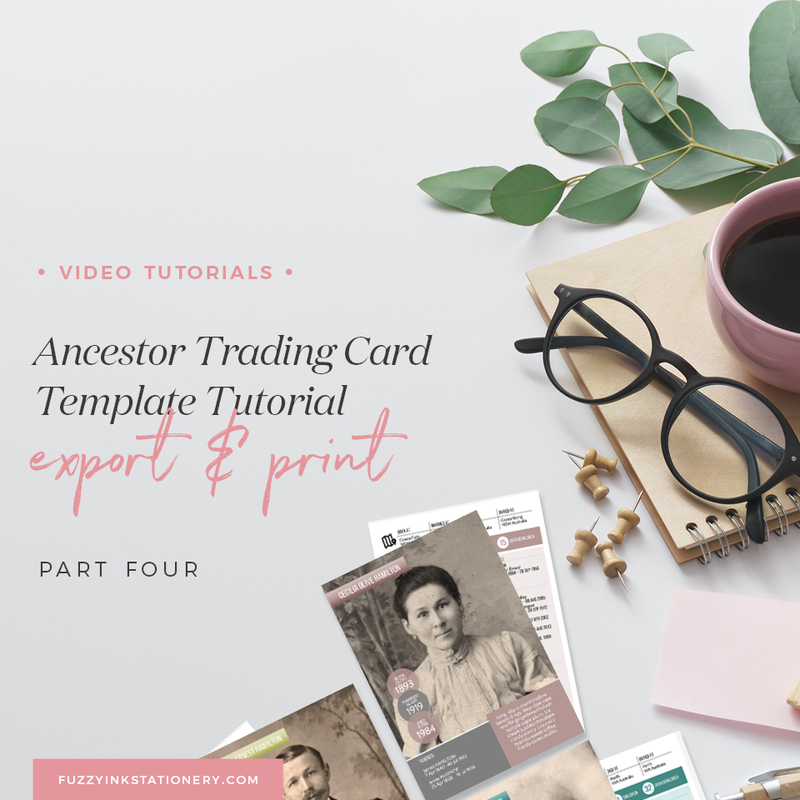 ​​This ​FREE ​Microsoft PowerPoint template is the foundation for creating your own print-at-home set of SNAP (Ancestor Edition). ​Perfect for games nights or family reunions.